Size: 38" x 32" unfolded, 4" x 9" folded. Commissioner of Highways: M.J. Hoffmann. The 1940 official map was the first to not be published by McGill Warner. The map's format and cartography were also totally updated. This map served as a prototype for the maps issued through 1950. However, the 1940 maps' color scheme and a few other features were unique. The new design was mostly finalized in 1941. The back of the map featured a new "blue" tourism photo spread, which replaced the old "green" feature seen on the maps in the 1930's. 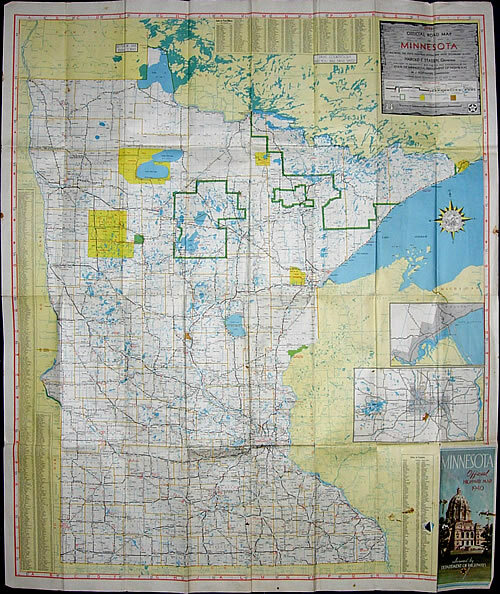 The 1940 map is the first to feature a message from the Governor of Minnesota. This feature would become a tradition on Minnesota highway maps until the 1960's. The Twin Cities and Duluth insets were given a new cartography format. Like the maps issued from 1934 to 1939, the 1940 map did not have a back cover.